The Knitting Pirate » In Which the Pirate Takes a Preliminary Picture. In Which the Pirate Takes a Preliminary Picture. You wanted a picture, you get a picture! Here is the Shapeless Amoeba Baby Surprise Jacket just after the buttonhole row. I have five more rows to knit. The color is about right, I think, but the dark pink may be showing up a little more vibrant than it is in real life. I may have to invest in a better camera if I want to keep showing off my work, or maybe build a lightbox. Despite my frustrations with garter stitch, this is actually an easy knit and a cute little sweater. I'll have enough yarn left over to knit a matching hat - the questions are 1) how big is a baby hat supposed to be and 2) will I have the time to get it done? 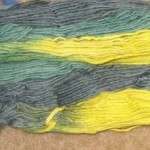 I do plan to knit the Baby Surprise Jacket again, and this is the next colorway, "Amarillo y Verde." It's more of the 100purewool worsted merino. Ideally, I'll knit this up before I know that anyone's expecting. It's a nice, neutral baby color and then I'll have it ready to give at a moment's notice! (Not that anyone's ever had a baby at a moment's notice, really, but you know what I mean.) Also, I might enjoy knitting it up more if I'm not working with a deadline. 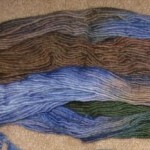 I've also got two skeins of this colorway, "Winter Joy." I wasn't expecting the green in it; the picture on the website only showed blue and brown. But I really like it and think it would be great for a baby boy, even with the green. The gauge I'm getting makes this a sweater for a 9-month old, so I guess these will only be good presents for a baby who's born between March and May. That means if someone has an out-of-season baby, I'm going to have to come up with a totally different project to knit. Maybe a pair of cute pants? 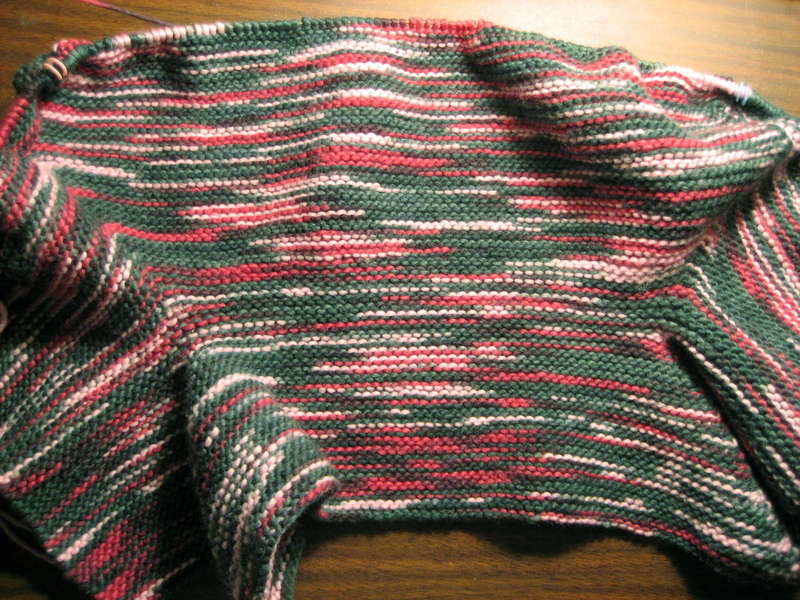 I'm not sure I ever want to knit a baby blanket again, unless it's a really interesting pattern and a quick knit. 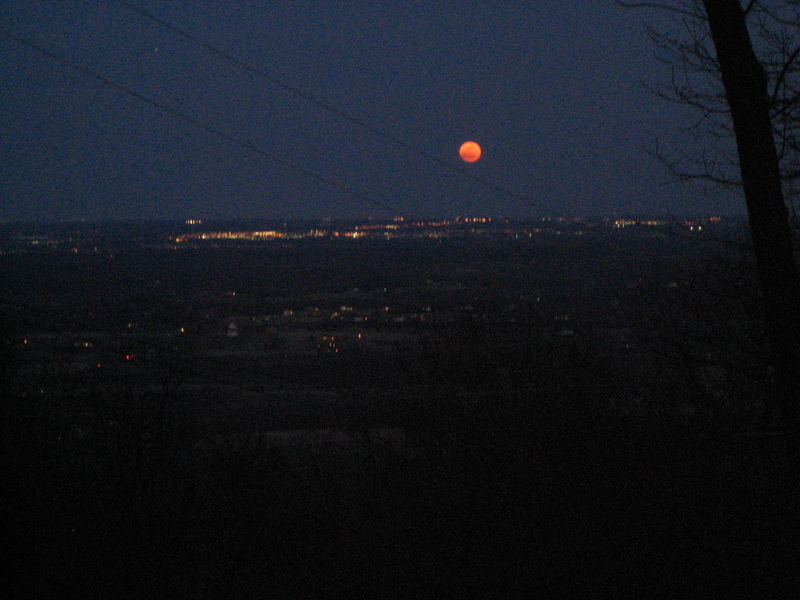 Because I'm showing off pictures already, here's a long exposure of the moonrise from my front porch. I took a dozen of these pictures and this was the best one of the bunch. 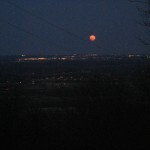 (Again, I may have to invest in a better camera.) You can't quite see it in this picture because it's out of frame to the left, but on a very clear night I'm able to see the Washington Monument on the horizon, about 40 miles away. 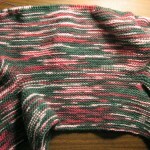 This entry was posted on Friday, April 11th, 2008 at 09:07 and is filed under babyclothes, BSJ1, gifts, house, yarn. You can follow any responses to this entry through the RSS 2.0 feed. Both comments and pings are currently closed. Yay for pictures! What I find works best is to use natural light instead of indoor light or a flash, as those tend to alter colors more. Daylight won't always get you accurate color, but it helps. Reds tend to overwhelm most cameras though, so that may be one reason the dark pinks show up more. I have problems with those and my DSLR, so getting a better camera may not fix it.